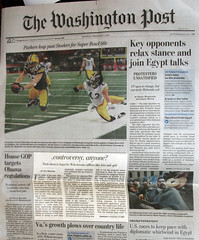 Washington Post (NYSE:WPO) posted anemic Q1 results. Newsweek has been sold and is no longer a factor. Media such as print and cable are declining and are not creating shareholder wealth opportunities. The major division is now Kaplans. Everyone is supposed to be focused on additional education and skills upgrades. Turns out to be a parking spot for the unemployed. Enrollment is falling as the jobless rate improves. So now we have a media driven company whose revenues decrease in down economies as advertising drops coupled with an education company whose revenues increase in a down economy. Washington Post has become a neutral hedge. So where is the dividend? If the company is neutral to economic circumstances will investors be paid to hold it? If not why would you bother. Revenues and net income are so off, the dividend is looking vulnerable. The key tell is looking at how the Q1 press release was constructed. There are no quotes attributable to executives. There are no comments about operations or future expectations. The press release was an elevator analysis focusing on the superficialites. No value added commentary was provided. When your income drops radically, management needs to speak to dividend security. Mushroom treatment is not acceptable.